Cat Food Inc. - the major supplier of cat food in town - has catnapped Nanji, Guy’s cat, and wants to use her to promote their latest brands of cat foods. Help Guy to rescue Nanji from the evil clutches of Cat Food Inc. This is a little puzzle game. The goal is to reach the exit. Push crates out of the way. Pick up keys and use them to open normal doors. Push the pushbutton to open the pushbutton door. 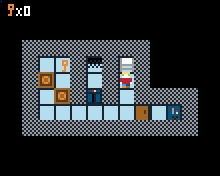 This weekend we have guests, so I won’t have time to add more levels or animations or sounds. That is a nice back story. I see that you have made Python games also before. Actually, the story in the original version was more detailed but I knew I could not fit all this text and images into the Pokitto version before the deadline. It’s all real programmer’s art.